Subject: Re: How Can This Be? The CLT panels that were recently referred to to in a previous post are plywood panels on a grand scale. 3, 5, or 7 ply, at 12' x 46' structural 'sheets'. Each layer of solid wood is edge glued, and at 90 degrees to the other layers, face glued and pressed. Plywood, eh? Very impressive. Now here is the conundrum. The conventional wisdom around here is that solid wood over about 1/4" will behave like solid wood - not veneer - and likely open up the joints or crack if subjected to normal cycles of humidity. Veneer is so thin that its propensity to expand and shrink is overcome by the bond to the other layers, typically at 90 degrees to each other, so no cracks. Stable. So thru the link we can see these panels are used for finish work, exposed to the elements, then living/working space when complete. Can it be that there are cracks throughout the panel faces everywhere? Can that be tolerated? I don't think so. So it calls into question our collective practice of recommending no solid wood glued to a stable substrate or piles at 90 degrees. The photo attached shows a solid wood panel that awe made 12 years ago, and it is in a South facing application and is fine. I would think that, just as you said earlier that the glue bond is stronger than the wood. What glue and What material did you use? I wonder if the result would be the same if you used white oak? The CLT's I have investigated require a proper building envelope as in the attached. I think those trying to use CLT's without a proper building envelope will not find they perform well as you point out. Using this product in London like the reference did seems risky. If you price out the CLT's you will quickly find they have limited applications. We are seeing them pushed by government bodies to use our own natural resources. The Honduras Mahogany panel in the photo was most likely glued for with and thickness with polyurethane glue - Gorilla, if my memory is correct. After sizing, we painted the edges with epoxy to prevent any water absorption should storm water get in between the panel and molding. The door has been poorly maintained and does show hairline cracks on the joint lines, but nothing serious. When I see it, I remind them that it needs to be maintained. Remember the old Lumber Core plywood we used to get ? It for the most part help up well but we don't see it available much now. This new product seems similar . Re: CLT prices. While the price for CLTs first appears to be exorbitant, when compared to forming and pouring concrete, waiting for cure (two weeks in some cases) the requirement for support bracing in the intervening time, CLTs begin to make sense. We are about to have a price on carbon and concrete has a very high carbon cost while wood is a carbon sink. Add to this CLTs have a much better fire performance than traditional construction methods and steel structures. Even without a carbon tax the CLT rep from my area west Quebec says the cost is less than poured concrete. I believe lumber core ply is all end grain besides the faces. Much like end grain balsa core in composite boat construction. It was before my time. I saw some about 20 years ago. The Gougeon Brothers(West System Guys) invented a method of modern teak deck construction on a boat. They bond 1 3/4" x 1/4" - 5/16" minimum strips of teak down on the deck. Then fill in the caulking gaps with epoxy/graphite . The graphite gives complete UV protection to the epoxy. Its gone one step further. They and other boatbuilders now prefab it in the shop like counter tops. They have a flat work surface. 1 layer epoxy/glass. glue down the teak, fill the gaps with the black epoxy. Sand it smooth. Then vacuum bag it to the deck of a fibreglass boat with epoxy. The top side is left unfinished because it provide grip. How big of a mortise tenon would fail? 12"wide 3" tenon is common with haunching. What about 24" with no haunching? That's basically a 1/2" 3/4" 1/2" bread board end. Glue up 2 panels of poplar. 3/4" x 6" endgrain x 24" side grain. Glue those to a core of 3/4" x 6 "x 24"(typical stick). Use regular pva. What will happen? The interior stick should prevent warpage. Will the shear strength of the glue withstand the expansion? Why don't hardwood floors blow up? They are hard fastened to plywood. I've seen several builder face screw unfinshed 12" wide pine boards down. 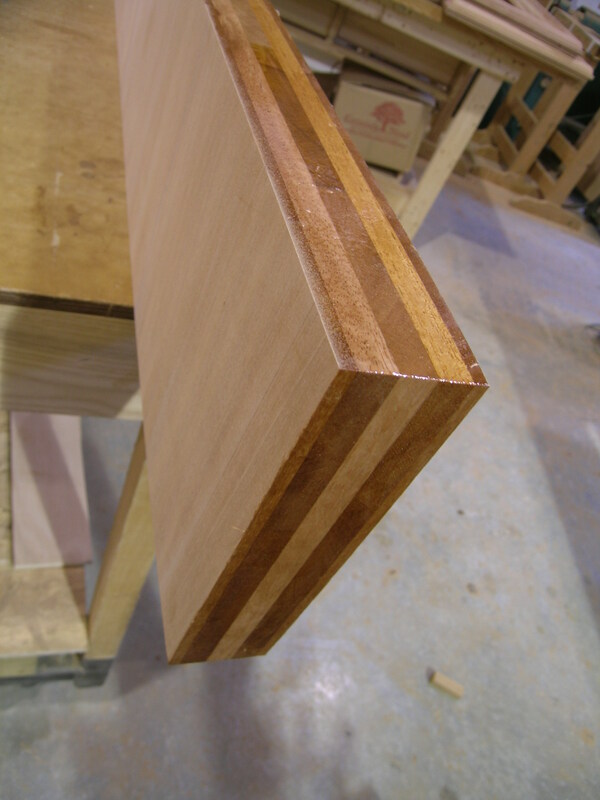 No finish-no splitting. From a physics standpoint. Where would the board expand. It is so mechanically fixed with glue, on both sides that it really cannot expand inside the panel. If anything if we look at our 3/8" venear layer in our shops as hypothetically unstable. Perhaps we are not fastening them hard enough. Another test would be to glue up a 3/8" x 24" x 24" poplar(unstable weeds are good for something) panel and skin one side of it with 2 layers of 10oz fibreglass and epoxy. These are all mysteries that we have all noticed that defy our "bible". I find it interesting and it deserves testing. I will do a test panel or two this week. The current thought is a 1/4" center of stable material, two plies of solid wood to make the panel raises, then a cross band of 1/16" Mahogany, then a face ply of 1/16" Mahogany. 7 ply panel, one with epoxy, and one with urethane glue. David, I'm glad you started this back up. I was wondering why it died so quickly in the one I started. Personally, I don't see how that structure could possibly survive very long. To start with, they call the material Tulip wood, which I suppose it Yellow Poplar, rather than the more expensive rosewood by that name. Without looking, I'm pretty sure that wood has very little resistance to decay, so any moisture infiltrating into cracks between layers is going to start to rotting right away. One thing good about it though, is that most woods are much stronger in compression perpendicular to the grain, than tension P to G, but YP is pretty close both ways, so maybe the compression at right angles between layers from moisture gain won't shear the glue line between layers. However, even if it doesn't tear itself going up in MC, I would expect the compression to be so high in panels that large to crush and cause a new memory which will cause checking as the Sun bakes the outside moisture off while the inside is still higher, and the cracks will just grow once they are started. I was a Yacht captain for a stint of my life, and I can tell you that maintaing a bright finish on that much exposed wood will be a major endeavor. Adam, it has been a long time since I use any lumber core plywood, and I'm sure it isn't all made the same. But the stuff I used seemed to be made up with 1/8" door skins on the outside of strips of luan probably held together with fiberglass thread until the skins were glued, but no edge gluing. This allowed some space for expansion, and any shrinkage was broken into very short segments. Nothing like balsa core marine usage, which I have used for some specialty projects in my shop. I couldn't tell if they were edge gluing the planks in the video, which would help break down some of the tension on the downswing, but would allow any water that infiltrated to run along those gaps. The wood shrinkage calculator on this site showed 10" change of 6% MC perpendicular to the long dimension of those panels. I hope those folks have something figured out, like a pressure treatment of something like a penetrating epoxy that will seal the wood way down deep. Brad: I dont' think the Smile structure in the link I posted earlier meets the 6 b requirement of being in a dry structure, with less than 15% MC. I was hoping Gene would weigh in on this discussion, but I have seen much activity from him on any of the forums lately. Does anyone know anything about him? thin veneers and rigid glue may work, but? 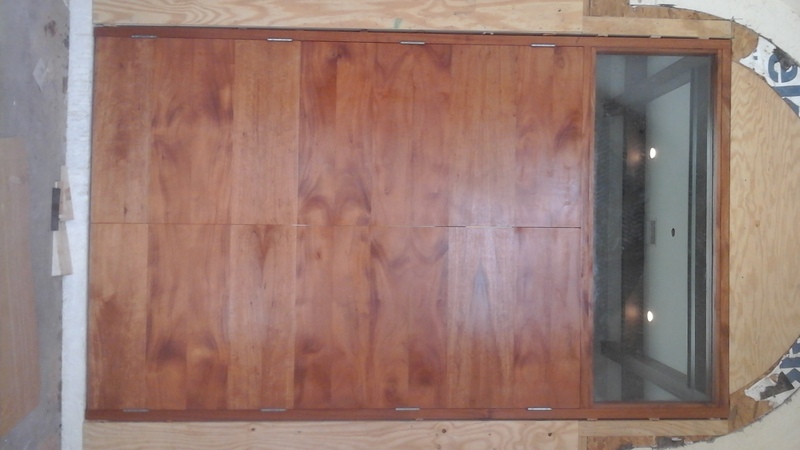 my latest series of doors have been thick 1/4 inch "veneers" and flexible veneers, pwa 600 moisture cured 3 in 1 urethane flooring cement . as ive discussed on this forum before, i assume the veneers will move , but doors are staying true and no cracking, typically movement is 1 /32 seasonally. As for the mysteries of wood, I'm not so sure that this one is a mystery to any but a few of us. All due respect to my brothers in dust, but I think we have somehow blown this up into an issue that is not an issue. I know that cross grain panel construction works if done properly - balanced plies, same MC, etc - since commercial plywood is a known quantity - stable, flat and true. The CLT's are just the same thing scaled up a lot. So why won't they work? I think they do, since they have been used for 20 years in European construction. Fairly elaborate equipment on a line, stacking lumber, applying glue and clamping and pressing (Electronic cure?). Then sanding, sizing and shipping. Bob's your uncle, eh? The English use of Tulipwood may or may not be the same as what we call Poplar around here. Like Keith, I think this wood a poor choice for anything exposed to moisture. I see it sprout mushrooms after 3-4 years around here. But who knows what the architect is really referring to since hyperbole seems to be a large part of the 'announcement'. I also remember lumber core plywood. 4x8x 3/4" or 1" thick panels of furniture grade Mahogany faces, balance matched, with a cross band of undetermined species and then a core of a lighter color wood, strips, not wide. The stuff was heavy, extremely stiff and flat, and very nice to work with. So when one thinks about the cross grain plies wanting to expand, but being restrained by the glue and the face plies (in an over-simplified 3 ply panel), the fibers in the center ply do indeed expand, but do so by crushing themselves and neighbors. Compression set is the term, as I recall. Since this happens, the panel is stable. A long as the glue holds in shear strength, something most wood glues should be able to handle easily. Hardwood floor boards all move in their own little space. MC and RH are important to laying a good floor. Adding too much moisture will cause buckling. I have heard that enough water will swell a large floor enough to push the wall framing (Chicago platform) off the edge of the floor frame. So I guess the question remains - can one of the most basic and recognized properties of wood be over-ridden? Are those of us that sweat the details nothing but a bunch of old women worrying over nothing? I'm itching to grab some 2x4's and start cutting and glueing. 12" cube. Cross layed. We just made a replacement door for one coming apart due to TBIII glue failures. The 1-3/4" thick panels had failed all the way thru the joint except for the last 1/8" that stayed glued. The replacement has 7 ply panels (or 9, depending upon how you count): core of 1/4" plywood, then Honduras Mahogany two sides at 5/8" thick, vertical grain. Then cross bands of horizontal grain African Mahogany, then face plies in vertical grain in African Mahogany. The 22" wide "fat sides" that are 5/8" thick are glued with urethane glue for width. All other laminations are with West Epoxy, and a vacuum bag with cauls both sides. The photos are of a cutoff for the arched door panel that is now outside in the gutter trough, soaking up rain. We made two other samples, raised them and will have them finished to the same near black finish as the door and will set them out in the sun. One is made the same as described above, the other is made entirely with urethane glue. Which poly glue do you use and why? I'm not a fan of the typical ones. It seems this will need to add a chapter to that book you are planning to write. This can be the chapter after the chapter that discusses the importance of considering the exposure when building exterior architectural components. When can we pre-order? There is a lot we can draw from the CLT example, but I think we also need to keep in mind the performance requirement differences. A structure such as the Smile and most other common CLT applications allow for greater deflection and creep than I expect your high end customers would appreciate in your doors or windows. Failure in a structural sense is losing the ability to carry load whereas failure for the woodworker is door function problems or finish problems that fussy owners notice. If we could control the differential moisture content thru the depth of the assembly I suspect one could relax about all the details. The differential moisture content is one of the main causes of bow in a complete wood assembly. Since the Smile is open I would expect the change in moisture content will be reasonably similar on both sides. That will lead to fairly uniform expansion/contraction that is unlikely to cause a significant problem. Keith, I agree the Smile will not comply with clause 6b from the link posted. I think a review of this art display by you or David in a few years will yield very different conclusions as far as long term performance than most others. I expect Arup will have a lot of carefully crafted language in their contract with the owner as far as long term performance and maintenance is concerned. I hope the Brits are better at keeping up with the maintenance than North American owners. Adam - We use Gorilla glue when we use urethane glue, but have bought larger quantities from CP Adhesives in the past. Virtually the same glue and behavior. There is probably no other thing in the shop that I have fluctuated so strongly on over the years. There were times when it was all we used, and we all loved it, then times when no one liked it, and we threw out partially used bottles since it started to gel before we used it. At one time it fell out of favor because we thought it failed on gluing panels for width in exterior situations. I now believe that was due more to dull joiner knives that glazed the wood. We replace the knives regularly and early now. I would use more plastic resin glue if it were not so temperature sensitive. A shop over 70 degrees is inhuman, and just not bearable for us. We have found that even wood at 68 degrees, in an air temp of 72 will cause problems. I now have two samples that are identical except in the fact that one is all epoxy laminated, and one is all urethane laminated. They will get a dark finish and then be put out in the sun. I wish I had done one in TBIII just for a deeper demonstration of the forces at work. But TBIII is terrible to try to laminate veneers with. lol, been a high of 90 every day for 6 months in sw fl. use plastic resin all year except when low, 40s temp. sometimes a fire drill, but get er done. 3 layer panels for flooring, cabinetmakers and doormakers have been around in Europe for a while now. They are marketed as a all natural product for those not wanting the off gassing of products like MDF. A East coast shop has been successfully laminating thick veneer to the foam core panel for years.